An Irmo High School International School for the Arts student was recently crowned Miss Teen South Carolina North America, and will soon participate for the international title of Miss Teen North America in June. Lily Richter was named Miss Teen South Carolina North America in January. Currently an International Baccalaureate Honor Roll student, Richter chose the Miss North America pageant due to the international exposure. 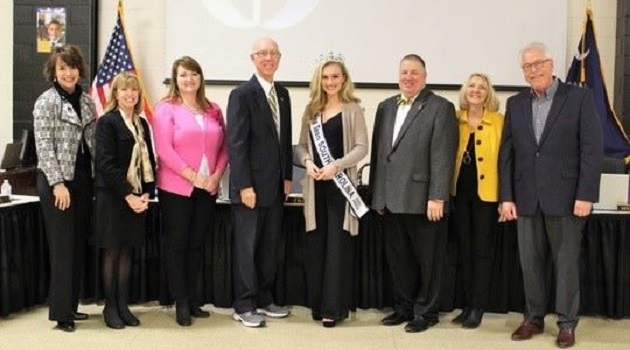 Richter, a senior at Irmo High School, entered her first pageant through the Miss Yellow Jacket program at the end of her Junior year as a way to try something new, be more involved at the school and impact the community. As a member of Mock Trial, Richter credits her ability to handle the pressure of the pageant interview with her experiences competing on the team. “To be successful in Mock Trial you have to be comfortable speaking in front of large groups of people so this has helped me a lot. Mock Trial involves a lot of thinking on your feet and this has significantly helped in pageant interviews,” Richter said. Among her other commitments, Richter also serves as a student ambassador, member of Student Council and varsity swim team. After the opportunity to study abroad in the South of France last summer, she plans to study International Business and French in college upon graduating from Irmo High School this May. “Lily embodies the Irmo student experience through her passion for service, academic achievement and ability to reach others through her thoughtfulness and grace shown to others. I am so proud and excited for what her future has to offer,” said Dr. Robin Hardy, principal of Irmo High School.